Thanks for all your help Crystal! We really appreciate all you did for us throughout the whole process! Thank you for all you do and answering all our questions, keeping us on track, and keeping the books! We couldn't have done it without your help and we love our new home. And our sincere thanks for all you and Sonny have done to make our dream home a reality. We just love it! Happy to provide any references should you need them. 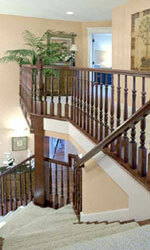 We can truly attest to your professionalism, dedication and attention to detail with the our custom construction. Our home continues to advertise for you! Michelle and I wanted to thank you for the nice Christmas card and also for all the help you given us over the last six years. We have purchased 6 homes over the years, and this is the first time that we have had a builder that we have been comfortable enough with to involve with all of our post purchase projects. We have been happy with all of them and look forward to future projects. Again, thank you for being a partner and a friend - Rick & Michelle Tyne - PS…the shower looks great!